And inspiring story after inspiring story, that’s what “Love is a Verb” reminds. 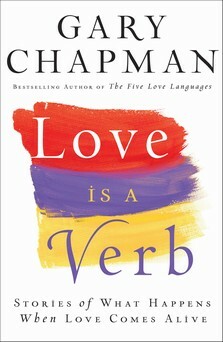 Chapman of course became somewhat of a celebrity with the publishing of “The Five Love Languages,” which sold 5 million copies. Here he offers 40 “love stories” by a whole gamut of people who share their real-life experiences of love in action — often not what you and I — or they themselves — expected. Many are by writers who have a vital faith life, so they not only know how to tell a story but they get — and pass along — the spiritual they find in the episode they share about. Chapman, a Baptist pastor in North Carolina, makes each story a teachable moment by adding a “love lesson” at the end of each piece. This is not a book to read from cover to cover. You could, of course. The brief chapters — the longest may be seven or eight pages and most are four or five — make for quick, easy reading. Better to savor the piece and its lesson a day at a time. In fact, don’t start at the beginning. When your — um, “loveliness”??? — needs a pick-me-up, crack open this 248-page Bethany House book and start reading a chapter wherever your fingers take you. Let the stories soak in.